At Smith Family Dentistry, our mission is to help our patients experience the confidence, self-esteem, and happiness that can only come from having a smile they feel proud of. As a leading dental practice serving the Charleston, WV area, we're proud to offer a wide range of dental treatments ranging from routine teeth cleanings to reconstructive treatments like dental implants. We strive to make dental care convenient for our patients, which is why we're proud to use intra-oral cameras at our office. We're proud to provide high-quality dental treatment at our Charleston office, but in addition to the dental procedures we offer, we believe patient education is a vital part of dental health – and with an intra-oral camera, it's easy for us to help our patients understand their dental health. 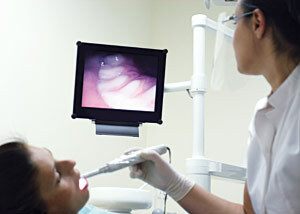 An intra-oral camera is a handheld video camera that's made to be about the size of a dental mirror or a large pen. Using a disposable plastic sheath to prevent contamination, we use the camera to take photos and video of the inside of your mouth – and thanks to the advanced technology in the camera, we're able to magnify the images up to 25 times and project them directly to a screen so you can see them. This allows us to show you close-up images of dental problems including decay, broken fillings, cracks, plaque deposits, and worn areas of the teeth. We can then print the images and add them to your patient file or give you copies to take home. Often, it's difficult for patients to visualize key concepts and processes in dental care – but an intra-oral camera solves this problem. By letting us display video of your teeth, zoom in on key areas, and pause for more detail, we can explain oral health concepts with true-to-life illustrations, allowing you to see and understand the problem with your own eyes. The intra-oral camera has become a critical tool for dental care at our office, and if you'd like to see it in action, we'd love to show it to you! Contact us today to learn more about the technology we use at our office or to schedule an appointment with us. We look forward to helping you achieve a beautiful, healthy smile – and showing it to you in detail with our intra-oral camera!